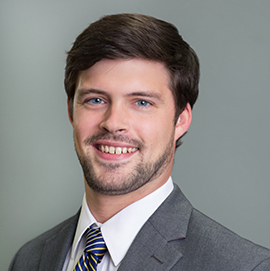 Bryan Kerr is a recent Physician Assistant graduate who was born and raised in Knoxville, TN. After graduating from West High School he attended the University of Tennessee where he received his Bachelor’s degree in Microbiology and Psychology. He then began his Physician Assistant studies at Lincoln Memorial University’s DeBusk College of Osteopathic Medicine and completed his clinical rotations in Crystal River, FL and Port St. Lucie, FL. Throughout his education and clinical rotations Bryan developed a love for Family Medicine due to his interest in developing strong patient-provider relationships as well as his interest in urgent and preventative care. He is delighted to have the opportunity to return to Knoxville with his wife Logan to serve his home town as a health care provider. During his free time Bryan enjoys hiking in the Great Smokey Mountains, playing recreational sports, and cheering on the Volunteers.